Hamas chief Ismail Haniya affirmed his willingness to meet Palestinian President Mahmoud Abbas “at any place” to discuss the internal Palestinian divide. Haniya’s remarks came in a speech on Sunday during a festival organised by Hamas in Gaza City to celebrate the 31st anniversary of the movement’s establishment, which saw the participation of thousands of Palestinian people. Members of Hamas’s armed wing, the Ezzedine al-Qassam Brigades, participated in the rally in camouflage and carrying rifles, while brandishing a range of weapons. The movement said the large turnout reflected widespread support despite domestic and external challenges. The Hamas leader also expressed his group’s willingness to hold elections, either the presidential or parliamentary. The talks were one of dozens of rounds – in Cairo and several Arab capitals – between Hamas and Fatah since the start of the Palestinian discord in 2007, but discussions have yet to bear fruit. Haniya also praised the “resistance” in the occupied West Bank following attacks against Israeli settlers and soldiers in recent days. 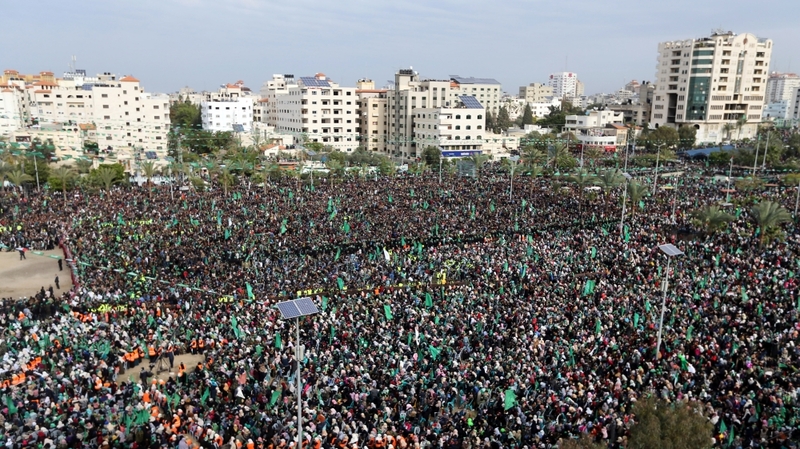 “We place our hopes in the West Bank, which is the main area where events are occurring and the most appropriate area to resolve the conflict with our Zionist enemy,” he told the crowd, which waved green Hamas flags. He told the crowd the pace of attacks would continue until US President Donald Trump’s policy in the region is brought a halt, singling out the decision to move the US embassy to Jerusalem from Tel Aviv. Separate shootings last week killed two Israeli soldiers in the West Bank city of Ramallah, while an Israeli baby, born prematurely after its mother was critically wounded in the settlement of Ofra, later died at hospital. “Our people in the West Bank never accept humiliation,” Haniyeh said, describing the recent increase in Palestinian attacks as “another Intifada”. Israel’s security forces say they arrested at least 37 Hamas operatives in connection with recent violence. Israeli Prime Minister Benjamin Netanyahu said on Sunday he issued a warning to Hamas after the deadly attacks in the occupied West Bank. “We will exact a high price over them,” he said. According to Haniya, the Qassam Brigades managed to seize a “security trove” during the failed Israeli security operation in the Gaza Strip, without giving further details. On November 11, the Qassam Brigades announced they discovered an Israeli special forces’ unit infiltrating Khan Younis, east of the Gaza Strip, and killed one officer in an ensuing clash. The failed operation led to an escalation in Gaza that left seven Palestinians dead. The Gaza Strip has been under an Israeli-Egyptian blockade since Hamas took power in 2007.